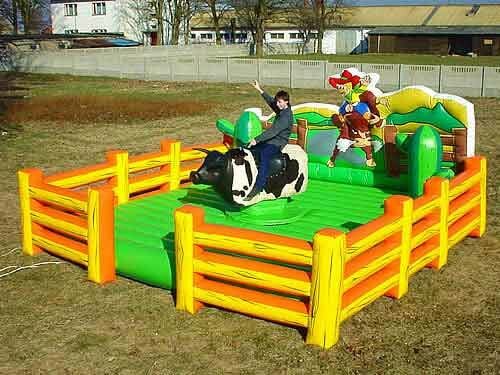 Mechanical bull rentals are one of the hottest attractions you can have for any party rental business. Bluegrass rides has been renting mechanical bulls for several years and employee the safest operators in the business. If you think adding a bull riding at your next event is a great idea. Your exactly right we have done many corporate events, project graduation, church outreaches, county fairs, street festivals in the follwoing states. Kentucky, Alabamba, Tennessee, Georgia, Indiana, Ohio, Illinois, Florida, West Virginia, Kansas, Missouri, Arkansas, Texas, South Carolina, North Carolina, Mississippi, and Louisiana. We have done in events in these cities and surrounding areas near me. Houston, Austin, Dallas, Fort Worth. We are serving nationwide so give us a call to reserve, Great for weddings, birthday parties, and team building.